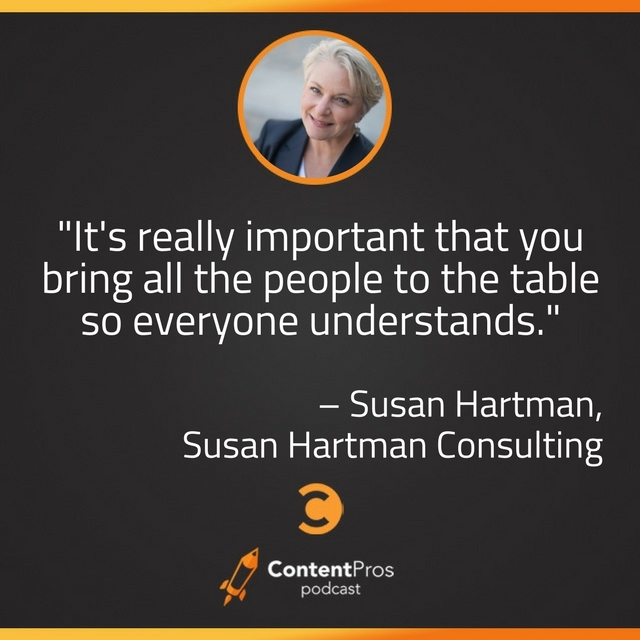 Susan Hartman, Partner at Susan Hartman Consulting, joins the Content Pros Podcast to discuss team coordination and how giving away knowledge can lead to tremendous growth. Trade secrets. Proprietary knowledge. Non-Disclosure Agreements. Sometimes business can start to feel like a spy movie. While there are certain aspects of any company that can warrant secrecy, what if there were a business model for sharing information? Susan Hartman of Susan Hartman Consulting says it’s not only possible but that she’s done it. At Schneider Electric, where she formerly resided as Director of Global Content Marketing, she was a part of a knowledge sharing program called Energy University. What they’ve proven is that by giving away information for no cost, and without a direct brand tie-in, it is possible to see positive growth in not only brand strength and awareness, but in sales as well. When you’re sailing, is that a quiet time for you to write or a time to step away? Susan is a fan of active sailing, which makes writing a challenge. But sometimes inspiration strikes! 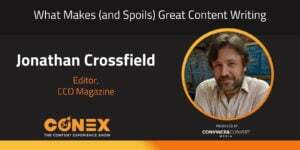 Randy Frisch: Welcome to another episode of Content Pros. I'm Randy Frisch from Uberflip, as always I've got Tyler Lessard joining me from Vidyard, and today we're going to talk about something that I'm always really passionate about. Not to take anything away from the importance of creating content in our organizations, but I think a lot of us have realized how to do that, how to go about doing that. 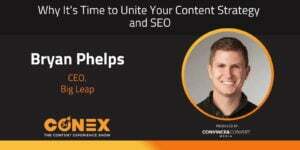 Our guest today is going to help us understand how we can actually leverage all that content, how we can distribute it, whether that's through different channels, whether that's through our internal teams; a lot of different ways to think about what do we do with all the content that we've amassed over the years of content creation, or the stuff that we're going to create heading into the new year. Tyler, I know this is something that your team focuses on a lot as well. Tyler Lessard: I'm excited about that perspective, but to add onto it, the idea of thinking about what channels do we want to leverage, and how does that potentially actually influence our content strategy, right? 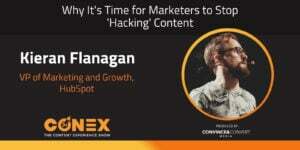 What kind of content should we be creating, based on the kinds of channels, the formats that we want to get out into the market, and letting that influence what we create, how we create it, and let really our creative juices flow, in terms of what it is we do as a content marketing team. To talk about some of that here today, we have Susan Hartman, partner at Susan Hartman Consulting and somebody who's been in the business for a number of years, spent years at Schneider Electric in the global content marketing team doing some pretty incredible programs, and now consulting with others on how to drive their content strategy. Susan, maybe you could quickly introduce yourself and give a little bit of background on your history in the world of content. Susan Hartman: Great, thank you. I appreciate that. Yeah, I've been working for Schneider Electric for the last 12 years and just recently stepped out to do some consulting work with both Schneider and some other organizations, large and small. But basically, the real content marketing thing came to life for us in Schneider Electric in a couple of ways, and that was about midway through the career with them. We decided we needed to start leveraging content, leveraging our ability to get broader audiences, and so that's when we really deep-dived into the whole content marketing concept and learned about the content marketing institute as well. Prior to that, I had done just a broad amount of marketing in general, whether it's working in the field, working in products, working on strategy teams. It sort of became a nice opportunity to pull all of that background and the content direction together and create a new way to flow the thinking, flow the ideas and think differently about how we do marketing and how we address content we create. So that's where I've been, and now I'm having a great time consulting with my past companies and meeting new companies and trying to help them out. Tyler Lessard: As you look back at the last few years, we'll talk about some specific programs that you did at Schneider that I think are great examples of leveraging content in different channels in very creative ways. What's kind of the hallmark of how you've approached content marketing, and is it your approach to the content strategy, is thinking in creative ways about the channels, like we're talking about here? What really gets your blood going when you think about interesting ways to make content a bigger part of your business? Susan Hartman: I really found that ... the first part is the shiny part, and that is how do you make these terrific videos and podcasts and beautiful web-based tools that can be used and shared, and that was actually the first attraction. I realized there were a lot of great ways that you could do that. But then one thing that I really came to understand was the level of frustration that people had and the challenge they had at trying to make that content move someplace, how to make it work for them or how to get into some new avenues of attracting attention. I really ended up bringing my attention more around how do you help people with the organizational view of that, and finding alternative ways, even if they're traditional ways, to take content and really leverage it, and then to bring everybody onboard. There needs to be sort of, I think what a lot of people have trouble with and their challenges are the cooperation. Not just the resources, but also the cooperation across functional groups, teams, knowledge bases. You've got your creative areas here and you've got your delivery mechanisms there, and trying to really bring everybody together. That was one of the things that I really felt was something we had great success with at Schneider and that I ended up spending quite a lot of time focusing on in that environment in particular. But I'll be honest; as I've talked to a lot of other organizations and teams, it doesn't seem to matter how big they are, they still have the same type of challenges. It seems to be a one-problem-fits-all kind of situation. Randy Frisch: So Susan, I'm interested to go a little deeper on that, and I think a lot of people listening to this podcast may be wondering the same. For context, when I looked up some of the things that you had done at Schneider Electric, I believe you were the director of global content marketing division, which sat under the CMO, which I think is great and very reflective of how forward-thinking Schneider Electric was at the time you were there. But as you touch on, and we're going to get to these examples of how you packaged up and distributed content, did that, to your point, live as part of the mandate for the global content marketing team, or was it on you to more so, and you just started to touch on this in terms of how groups work cross-division, or was it on you to figure out how, say, the demand gen group did that? Or how perhaps even the social teams did that, in terms of how they leveraged content? Who was it on to package the content versus make that content available? Susan Hartman: Mm-hmm (affirmative). So sort of an unusual structure in the space that I was in, so I probably should give you the descriptive of that first: our global team, we were starting out by basically bringing forward this concept of how to do content marketing, and why would we use it, and try to evangelize it in the organization. That meant working with the business units, which, even though they do get direction out of the CMO, they operate as independent business units, and there are about six major global business units. So the corporate level really focused more on, what are the broad-based messages, the broader stories, the higher-visibility things that we want to bring people's attention to the brand? We were focusing more on that level, but then really it was a two-fold experience in my space, because I also needed to work with the businesses to help them and guide them and give them some direction and bring recommendations of tools they could use or methodologies they might try or, you know, where could they get resources, things of that nature. We're really talking about a very big company that started at the beginning phases of this about, maybe almost five years ago, and then really evolved considerably to where they are today. It was a little bit of a consultative effect to the businesses, but at the same time it was also driving that same content mission around what the brand and the message was for the company itself. I don't know if that helps to sort of paint the picture a little bit. Randy Frisch: It definitely does; maybe you could give us an example. I know we keep talking about some campaigns that were done, but maybe you can give us an example where you worked with another business group to either package up content for them for distribution, or armed them with the content that they could package up themselves. How did that work in a real-life example? Susan Hartman: Okay. I'd say one of the biggest examples that we took on; this really was more last year than this year: we developed a key set of stories, and I wasn't the only one driving this, this was a whole team of us that came together with the heads of the business marketing teams for each business unit. It was determined these were going to be the major messages coming out of each business in alignment with our brand, and what did we want to say? What was the high-level story to put out to the marketplace? How do we want to display that? Everyone came together and we gave some recommendations, and what kind of floated to the top was the idea of these really interesting and engaging, interactive e-guide type pieces. Very visually dynamic, very rich with information fed from the business unit, wasn't something we would write, of course, but we would help to craft the message, help them to do the writing, help to put the design together. My piece in the middle of this was to help bring to the table the marketing people from the business who had the expertise and the understanding of the industry message, the graphic design people who were actually working with the software to develop the e-guide itself, our web team, who were preparing micro-sites so that we could house those assets and we have a place for them to live, and then the social media team ... this is a cast of thousands. The social media team who prepared for all the social aspects of it so that we could leverage those stories once they went live. That was one way that we could counsel the businesses on some best practices and some really great tools that could be used, and to also help to guide the design and the messaging that was built into the asset itself. Tyler Lessard: I love this topic, and it's something that I know, even in our own team, we continue to try to get better at. You touched on a few things there; it does take a village to bring a content strategy to life, and I get frustrated when we create a great piece of content, quote-unquote, and it's not built under the expectation that it's going to go out and be leveraged by all these different teams, right? It's great to write a great e-book and put it up on your website, but what are the driving principles behind that? Why did you do it, why did you take the approach you did? It's such a difference when you start with engaging those teams, and you bring in somebody from social, you bring in somebody from demand, you bring in somebody from the video team, right? And you brainstorm and go, okay, here's the story or here's the topic. A, let's come up with some creative ways to express that and to create that, but then if we're going to use it as a lead gen tool, how might we, again, package it up to make sure it's going to work effectively on this channel and this channel? And what should we do for social? Maybe there's a social extension to the campaign that somebody has the idea and it changes the way you think about the content you create. That stuff gets me super-excited, when we collaborate as a team and go, "Here it is! ", right? And then the content team is really then focused on "How do I now create this in a way that these different teams can leverage it?" The results are always better, always, I think without exception, when we take that approach. I assume you see the same things: what are those teams, if somebody were to say "Okay, what are the four or five teams, or maybe more, that we should be consulting with as part of the creation strategy, not just afterwards to throw it out to?" Susan Hartman: To backtrack on what you just said, that's why I gravitated to doing that, because I really loved the collaborative nature of it, bringing everybody to the table, everybody understanding how this is going to benefit the business, how it's going to benefit us as a company, how are we going to leverage this to create more brand awareness, how are we going to turn this into a lead gen opportunity? And the businesses are responsible for those numbers at the end of the day, so when they can communicate that out to their sales teams, either in the countries or wherever their teams might be, those guys are really jazzed because now they've got something new to talk about. They've got something new to share. So I think it's really important that you bring all the people to the table so everyone understands it, holistically, why you're doing this. And then it gets that push. It's almost like it creates that ripple effect, and it just pushes right out into the right parts of the organization to get it distributed, make sure it gets used, and now you're telling a story that really takes effect. Randy Frisch: That's great advice, Susan. So now that we know the right people sitting at the table, let's take a quick break here on Content Pros, and we'll be right back to talk about some of the other campaigns you've executed with those groups, right here on Content Pros. 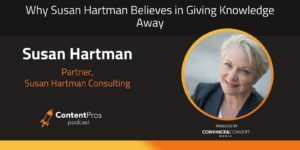 We're back here on Content Pros, speaking with Susan Hartman about how we leverage all the content we've created in our organization, and she's done some really great things over her career and nowadays, working with a lot of the clients that she knows to bring some of those best practices. One of the stories that you were telling us about before we jumped on the podcast today was a university of sorts that you created that really was content marketing at its core. I'm wondering if you could take us through using some of the framework and mindset that you lined up in the first part of the podcast, how that came to be and how you ended up deploying that. Susan Hartman: Sure, I'm happy to. The program is called Energy University; the URL is MyEnergyUniversity.com, and I invite everybody to go and visit it. It is a free, online education program that's provided by Schneider Electric, and while the program is offered free of charge, it is also a vendor-neutral program, in that there is no product association that's tied into the education. So keep that in mind, because I'm about to tell you where the background of this comes from. If you go back almost ten years, the then-CMO of the company recognized that the body of work that was provided by the engineering team, in terms of white paper content, was all living on this one space in the website. He starts looking at analytics and realizes they're getting global downloads in the thousands and thousands every single month, every year. And he decided that, he thought it should be converted: why couldn't you take some of this material, convert it into something a little bit more attractive, appealing, and broad-based, and then push it out and let people have access to it? And let's see what happens. What started as his sort of interesting experiment in that turned into something that really manifested itself into a strong brand awareness, and eventually lead generation program. So what we did is we took the white paper content, which is your foundational bit of knowledge, you convert that into something that is a web-based module of learning, it's got all of the components around learning and adoption, adult-learning principles, et cetera. It's designed by an instructional designer, so it's not just small bootleg stuff. We really put a lot of invested time and money into these modules. And then we built them into this entire wrapper of a university, so what was interesting is that as we launched the program and watched the traction grow, year over year, we found that there were people coming to this program and finding it organically from a variety of different countries all over the world. When people come in, they would register, they give some basic information, they take the courses of interest. The content is all based around the different theories and best practices of the industry space that Schneider focuses on. You now look at this body of material that's being offered, and it's essentially your internal expertise. It's your deep knowledge, it's your deep philosophy of what your company's principles are based on, and what their product innovation might be based on. Now, you're not giving away trade secrets, but you're really talking about the stuff that helps people to understand why is this the right way of approaching things? Why would you go after a solution such as X and Y, and then how could I find that solution? And so it created this wonderful loop-back of people coming to the site, taking the knowledge courses, responding to us through the email drip campaign that we created with them, because we communicated with them regularly, and then eventually they came back in and became part of our sales process, because we tied this into our CRM. It was really a pretty remarkable growth curve, and to give you an idea of how highly adopted this became, I'd say that even as of the time that I left Schneider, 60% of the users that came to the site came to us organically still, and then you had, I think, the one-million mark in courses taken was in March, and over 600,000 people globally had taken those courses. So that's over the span of ten years, but it gives you an idea of the volume and the amazing amount of interest and thirst for knowledge that people have for this stuff. Randy Frisch: So maybe you can just speak to, I mean, it sounds like a genius idea now, right? In retrospect, that many courses taken, 600,000 different users, I think you just said? Randy Frisch: I mean, how many of our campaigns get 600 views or likes these days? It's amazing to think about the work that would've had to go into that. Maybe you can talk about how you pitched the goals of it at the forefront, versus the real outcome that you've seen, and how that maybe changed over that period as an organization, and how you view, how it's changed the view of content even in the org. Susan Hartman: I think that when they started it, the idea was simply to get, you know, open the doors and get as many different people interested in the company, really looking at who the company was, what were we talking about, and then also really creating that opportunity to engage with them. So that was always part of the objective; it was never just to be philanthropic about things. What ended up happening is that when you started to recognize that that content really had a lot of traction and a lot of interest and value to those end users, and that it created this deep relationship with a lot of them, that's when it became much more seriously viewed by senior management. We were always giving reports and analytics and, you know, your basic numbers, as you say. Your basic numbers are great, that's wonderful, and then you get to a point where you're suddenly tying this to the fact that you're helping to support strategic accounts for the company, or you're helping to identify X amount of new opportunities for leads. That's where it suddenly changed the mentality of the use of the program and really got us thinking about it in a different way. And ultimately, there are certifications that are tied to it which drive some revenue, but when we were able to finally kind of backtrack this within the CRM, the salesforce.com system, that's when we were able to say, okay, this isn't just something that's part of our cost center, isn't this nice, this is now actually something tied to us bringing in, helping to bring in some revenue. So they looked at it, didn't become part of a profit center, but it really changed the perspective of how you looked at taking content that you might otherwise have thought was just another white paper, and then creating something that converts it using what's seemingly a standard thing, online learning, and then you're suddenly generating a whole different avenue of interest and way of reaching a broader audience. That's when everybody started to see the whole program in a much different fashion. Tyler Lessard: I l-l-l-l-l-love this so much, and I'm not stuttering, I'm just emphasizing how much I love this program, because this is something that we've tried to do as well, and Randy, back to your retrospective notion: I wish, and maybe this is a tip for everybody out there, I wish a year ago I had started building some iterative content, some e-books and some videos and so on, which the vision that a year from then, we would take it all up and then package it up as, like, a university or some kind of course ware or a drip campaign or something. Susan Hartman: You still can! Tyler Lessard: I can do it! Susan Hartman: It's never too late. Randy Frisch: Our friend Andy Crestodina talks about it, I think, as lifetime body of work, right? Randy Frisch: And the idea of pulling together all these assets, whether it's to write a book one day, whether it's to have to university program that you've been able to successfully launch. Even Tyler, some of the things I've seen you guys do recently that I'm envious of Vidyard are your chalk talks. Those have, to me, become a different form of education: really easy to consume, really snappy, and very series-based. Tyler Lessard: Yeah, and one of the, actually very interesting, to point, I'm literally in the midst right now of working on repurposing those chalk talks into packaged guides and courses. This is one where I actually did practice what I'm preaching right now, because as we built out the schedule for those weekly chalk talks, I looked ahead and said, okay, we want to eventually build a getting-started for video in demand gen guide, and so we made sure we created a series of chalk talks that addressed the different topics, and I'm literally now in the process of packaging those up and going "Here's a new sort of mini-course for a demand gen person on how to get started with video," and it's effectively just a series of five of those chalk talks that we already did. So reflecting on it, I guess I did learn something along the way, and we started doing this in a smaller scale, but that's exactly right, and it's such a home-run when you get that efficient of scale. Lots of good takeaways there for our audience. I'm reinvigorated on some of those things we're doing now and appreciating how it could all be leveraged through these bigger channels. Love it. Thank you, Susan. Thank you. Susan Hartman: Yeah, I mean, I'm happy to talk some more about ... believe me, I could get really detailed about some of the aspects of this program, but I usually try to pull it up, pull it a level so that, you know, I don't get too deep into it. But there are a lot of amazing aspects of it, and I'll tell you, the thirst for knowledge out there. I didn't know what to call this, I just kept calling it "knowledge marketing." The marketing of your expertise and your knowledge and your understanding; I really think that it made a huge difference in leveraging the relationships, especially when you look at your strategic relationships, because those are the hardest ones to really crack, the deep, big corporate type of deals that get crafted within companies. Sometimes you just really have to convince them and let them believe that you understand what you're doing, and really understand what they need and what their problems are. When you can really create that intersection, it's pretty amazing. Randy Frisch: -is that you're a sailor, so I guess my question for you is, when you're sailing, is that your kind of quiet time to find an opportunity to write, or is that a complete disconnected time for you to enjoy the scenery and to step away? Susan Hartman: Yeah. In the active sailing part of it, I'm not a passive sailor, so I wouldn't be writing at that point. I definitely like to be out there and in wind and weather, but when you get to places, Rhode Island is an amazing place, so if anyone knows our coastline, you know what I mean about how beautiful it can be and how many places you can tuck in. It's quite peaceful. But that is a great ... it's interesting you should say that, because I remember on a couple of trips this summer, I was like, oh my God, I got to write this down. Suddenly I'm trying to jot notes into my phone so that I don't forget. You come up with some new thoughts and ideas or suggestions for something you're working on. Yeah, it's great. Plus it's just a great challenge too, it's a lot of fun. Randy Frisch: Great. Well, it's been so much fun getting to know you. Some of the things you've done at Schneider are really exciting, and some of the things that you're able to take from that and now work with some of your own clients is probably exciting for you yourself. How can people learn more about what you're focused on or what Susan Hartman Consulting is all about? What would be your call to action at the end here? Susan Hartman: I would invite anybody who is trying to work through certain challenges of any portion of content marketing, whether it's organizational or if it's resource or if it's trying to think of new ways of coming at the same old problem, I'm more than happy to work with them. I work with, as I said, big companies; I'm still doing some work with Schneider. But there are others, larger companies I'm doing some small projects with, and then I do really enjoy working with mid- and small-sized companies as well, of all types. One of them is a university-based group, another one is a person who's doing some publishing. It's a whole variety of things, it could be somebody ... I've dealt with some folks that are in the sailing world, too, so I'm kind of distributing it, like I said, the solutions fit all of the different scenarios, so if anybody's interested in having a conversation about how to go after some of this or to talk about the Energy University model, I'm more than available, and my website, SusanHartmanConsulting.com, is a great way to reach out to me. Randy Frisch: Sounds great. Thanks so much, Susan. On behalf of Tyler at Vidyard; again, I'm Randy at Uberflip, and I appreciate everyone taking the time to make this one of the podcasts that they listen to. Please tune in to others at ContentProsPodcast.com, where you can find all of our past episodes, and thank you so much for listening. Please leave us feedback on iTunes, Stitcher, wherever you find your podcasts and can do so; let us know what we can do to make these valuable. Until next time, this is the Content Pros podcast.